Stacked Rd13 team buddy. Loving it. You're gonna fly up the rankings next week with that team. @Liverpool_Bulldog wrote: Stacked Rd13 team buddy. Loving it. Just focused on non origin under priced players and it just so happens most of the good ones play this round. Everyone misses one game due to origin so the other benefit is I get their points rd 14 onwards too. @Krump wrote: You're gonna fly up the rankings next week with that team. Round 17 I will take a hit but no point wrecking your team for one round. He's back, and with no origin his main focus is on a stuttering Storm. Smith was a late decision mate? Well done on bringing him in. @Liverpool_Bulldog wrote: Smith was a late decision mate? Well done on bringing him in. Due to Surgess having a high BE and recovering from injury, I wanted to give him another week. Then had to decide which gun to bring in this week for the best points return, and research led me to make the Smith move. Would leave me with approximately 150k for a fix/upgrade or 220k spare if min price red dot player. Round 17 is a write off but will captain Cam and hope for the best there. Though there is 2 or origin games a kiwi/england international and plenty of injuries away so no guarantee your players will be there for it. Secondly my cows have all peaked so to hold them on the hope they are good then doesn't work either. Big props for the Dugan love pal, I am still feeling the pain from bringing him in the week he got injured. Such a big risk but he has pedigree. Loving the big change up there. I want to do something similar but cash is pretty skint. 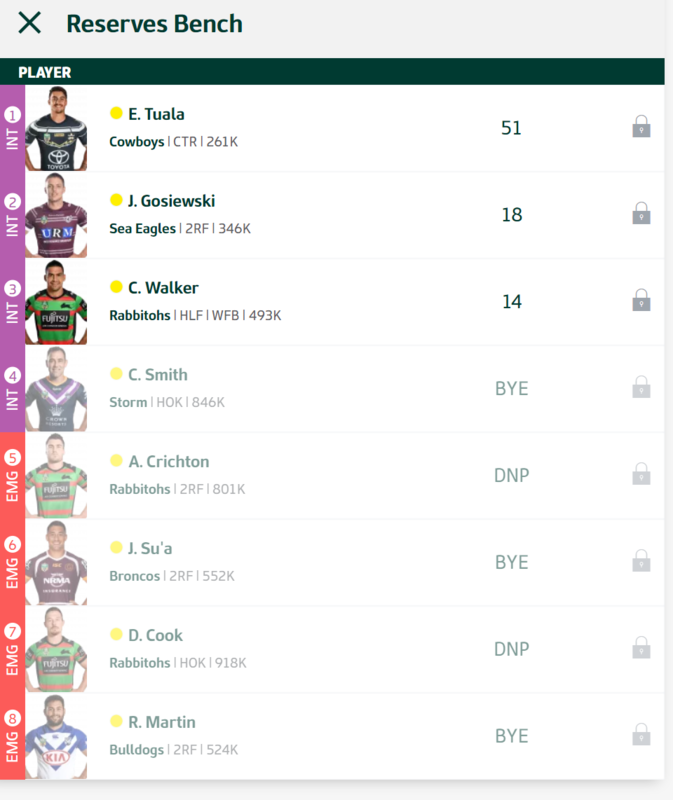 A max cash out is my big question, not sure who is worth bringing in, maybe the big roosters winger??? @Liverpool_Bulldog wrote: Big props for the Dugan love pal, I am still feeling the pain from bringing him in the week he got injured. Such a big risk but he has pedigree. I think he is worth the gamble and with cover (Fonua) I feel it is worth the risk. He will average similar to Trbo given he plays a minimum 1 extra game, is guaranteed fullback in a good sharks team and will want his Blues jersey back. Considering CWalker but he really needs tries to score well, so will do some more homework on him to see if he is the better gamble. Watching him he really needs that big play to push his score up, Dugan to me seems more involved and as you mentioned has some pedigree to him. Walker is also 39k cheaper. Much cheaper than TTurbo and if he stays fit is an absolute no brainer just like last time I purchased him. 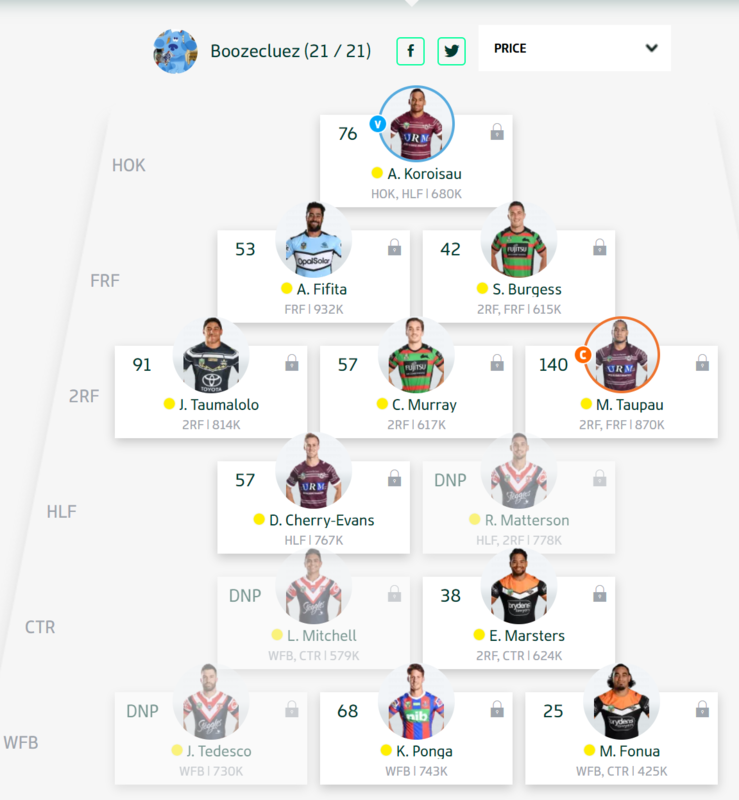 I already have Walker so it will allow me to play him in the CTR and push Fonua to cover both of those possies. I'm not a huge fan of bringing in Taupau at that price but I can bring him and NBrown if I bring Molo along as a cashout, surely he starts to see some more time with the Cowboys in the state they are. Thing with Taupau is if he plays 60 minutes vs 50 minutes. 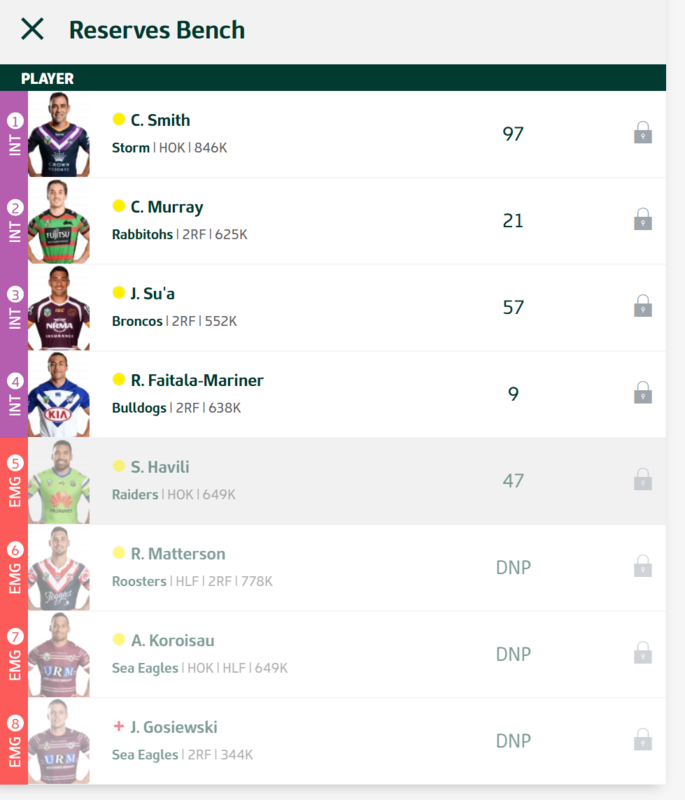 I am not usually one to worry about minutes so much but on Taupau this is the difference between 50 and 60 points. I could go Surgess regardless and grab Arrow later which gives me that essential FRF/2RF cover but then what do I spend the $$$ on. NBrown is just so risky given his long layoff and he isn't really that cheap to offset he risk. I had to come to grips with paying top dollar for one player given I paid unders for the remaining. 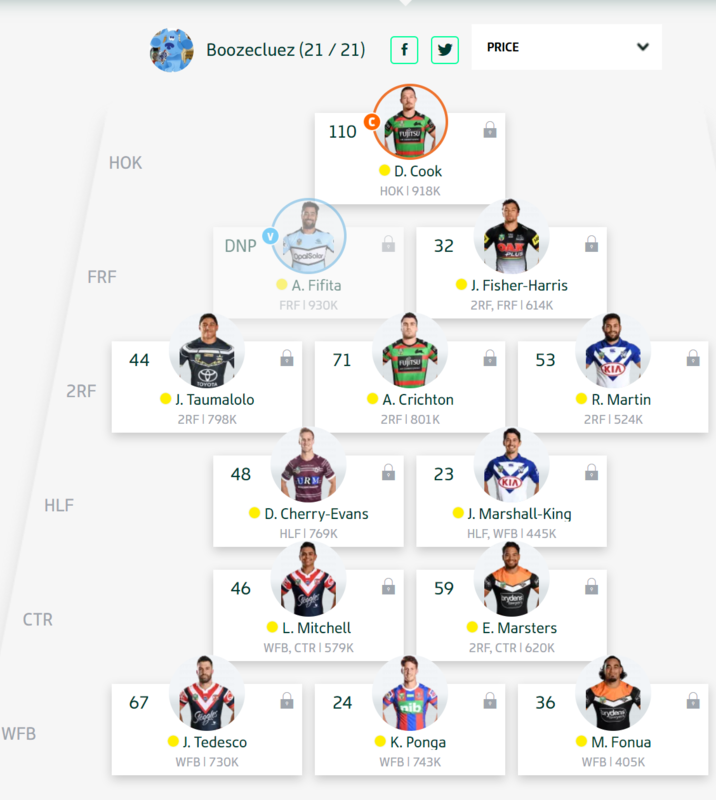 Edited: While Fitzgibbon frees up cash and get's me a Su'a Upgrade instantly, I am lacking FRF cover and that hurt last week. So if paying a premium gets me that too with Taupau then I think it may be worth it for the 100k extra. While this is a premium priced purchase it is for someone in decent form playing big minutes. a depleted Manly forward pack then we have a winner. Big Sammy is having an indifferent year but when he stays on the field he scores well. A value buy version of Taupau above he helps balance out that purchase and has potential to be a cut price keeper. He has DPP which helps provide cover and due to his role in the team is basically a swap for JFH who has done his job. Think he can lift and get back to some early season form, priced at 37 points and has a history of averaging 45. Gives me options with DPP as well so worth the gamble. The tackling machine himself and capable of a big score on his day the Arrow is a fantasy beast. By trading Su'a this week it means I can essentially swap him for Harris. 6 trades remaining and essentially a complete team with plenty of cover.